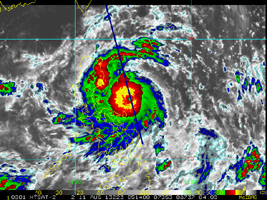 NASA's CloudSat satellite flew over Typhoon Utor in the West Pacific on Aug. 11, 2013 at 0518 UTC, passing within about 6.2 miles (10 kilometers) from the center of the storm, and revealing the structure of the storm's eye and eyewall. At the time, the storm contained estimated maximum strength winds of 132 miles per hour (115 knots) and had a minimum pressure of 937 millibars. 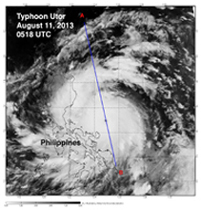 Utor's strength was equivalent to a Category 4 strength hurricane. 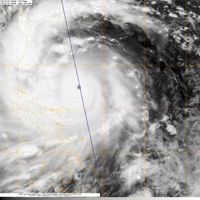 The CloudSat overpass reveals many unique features of a well-defined and intense typhoon (tropical cyclone) -- outward sloping eye and eyewall, rainband areas, moats and areas of high reflectivity (greater than 30dBZ). Heavy precipitation is distinguished by the attenuation of the radar (lack of signal) in the lowest 3.1 miles (5 kilometers) (up to almost 6.2 miles, or 10 kilometers, in the eyewall area) of the CloudSat swath. The CloudSat overpass reveals large amounts of liquid and ice water spread throughout the storm and also distinguishes rainband areas separated by moats (cloud-free areas) beneath the cirrus cloud-covered top of the storm. This is one a handful of cases where CloudSat has directly intersected the eye of a storm of this intensity and size. The Moderate Resolution Imaging Spectroradiometer (MODIS) on NASA's Aqua satellite captured the infrared image taken a few minutes before the CloudSat overpass (the blue line A-B on Figures 1, 2 and 3). CloudSat is a satellite mission designed to measure the vertical structure of clouds from space. The radar data produces detailed images of cloud structures which will contribute to a better understanding of clouds and climate. Quicklook Images can viewed at the CloudSat Data Processing Center.